Let me tell you about a neat pair of sandals I recieved today. 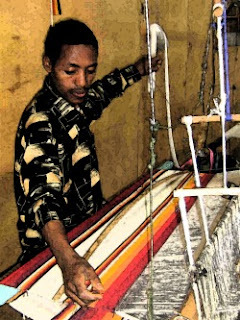 They are proudly hand crafted in Ethiopia.Very nicely made and selected in a color and style that to me will look great with a pair of jeans or jean capris! soleRebels began in 2004 as an idea: to bring jobs to the community of Zenabwork , a small village in addis ababa , ethiopia, a place where there literally were none.A "better life" was created by using the community’s incredible artisan skills and channeling them into a sustainable, global, fair trade footwear business. soleRebels features collections of superFresh , comfy + cool sandals ,slip ons, flip flops and shoes and an array of recycled and sustainable ingredients like hand spun + hand loomed organic fabrics and a pallete of unique natural fibers including organic pure abyssinian jutes and PURE Abyssinian KOBA. Your going to love their footwear as they have a variety of styles, each custom made for your style, size and color preference. sole Rebels are generously offering 2 lucky readers from Canada or the USA a chance to win their own pair of footwear in their choice of size, style and color. PLUS for each winner they will throw in one of their famous soleRebels WALK NAKED t-shirts!! A random draw will be made by Random.org on July 15, 2011 from all entries recieved. Tell me what type of footwear you wear most in the summer? Flip Flops, sandals,lace ups, slip ons, etc..
*** Please note: I had to pay a duty fee of $15 for these. You may be charged as well if you win. I mostly wear my Croc sandals. I wear flip flops all summer & hate when the winter comes and it's boot time! I am usually just slipping on my crocs to wear around the door,,but if I am going somewhere I will wear my sandals. I wear nothing but flip flops! I wear sandals and clogs. I am forever in my flip flops!! I LOVE them! I am following oneincome on Twitter! I wear sandals and slip ons the most. My kids were flip flops every where. mostly flip-flops..and barefoot many times! I'm a flipflop gal in the summer! I wear different things but my fave are my sport sandals.